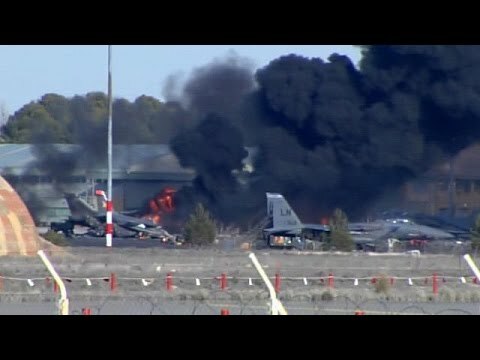 Ten people have been killed and 21 others injured when a NATO fighter jet crashed at an airbase in central Spain. Spanish Prime Minister Mariano Rajoy said two pilots were among the dead. The other eight were French citizens. Rajoy said there are “many injured,” ten of them French and 11 Italians. One witness to the crash said that the accident happened very fast. “Just after taking-off on the runway, I noticed the plane turned right and hit the ground. It then exploded,” he said. This entry was posted on Wednesday, January 28th, 2015 at 12:36 am and is filed under ARMED FORCES. You can follow any responses to this entry through the RSS 2.0 feed. Both comments and pings are currently closed.